One of the world’s largest toy manufacturers – American company Mattel, known as the producer of Barbie dolls and toy Disney characters - raised a storm of indignation in Poland, as one of its latest card games contains the phrase ‘Nazi Poland’. 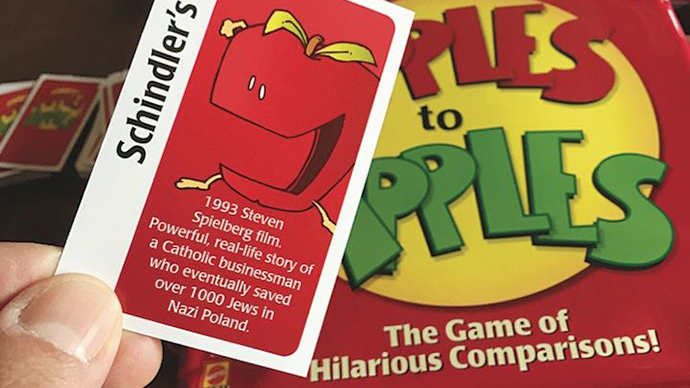 Polish Foreign Ministry said that the wording is “completely inconsistent with the historical truth and detrimental to the good name of our country.” It added that the Polish embassy in Washington has asked Mattel to withdraw its ‘Apples to Apples’ card game. Apples to Apples is a party game in which the players need to guess a word from its description on a card. It caused a strong reaction in Poland, both from the government and community - Poles have even started a campaign on Twitter aimed at correcting Mattel’s mistake. Foreign Minister Grzegorz Schetyna said the Polish ambassador to the USA has written a letter to Mattel officially demanding the American company to correct the error and remove all the copies of the game containing the offending cards. “The Embassy immediately intervened with the president of the company, calling on the company to correct the mistake made by Mattel – which is completely untrue from a historical perspective, and detrimental to the good name of our country. We hope that it will be effective,” the spokesperson of the Polish Embassy in the USA said, as cited by Radio Poland. The embassy also confirmed on Facebook that it had contacted the CEO of Mattel. It is estimated that more than 3 million of copies of this game have already been sold. Just a few days ago, FBI Director James Comey caused similar outrage in Poland by implicating it as cohorts of the Nazis in a speech at the US Holocaust Memorial Museum, as published by the Washington Post. It says "In their minds, the murderers and accomplices of Germany, and Poland, and Hungary, and so many, many other places didn’t do something evil. They convinced themselves it was the right thing to do, the thing they had to do." Following a strong reaction of the Polish authorities and their demand of an apology, Comey said he regretted his remarks. "I regret linking Germany and Poland ... because Poland was invaded and occupied by Germany," Comey said in a letter to the Polish ambassador. Poland was occupied by Germany at the beginning of World War II and lost millions of citizens, including 3 million Polish Jews. Warsaw was also razed to the ground after an uprising in 1944.